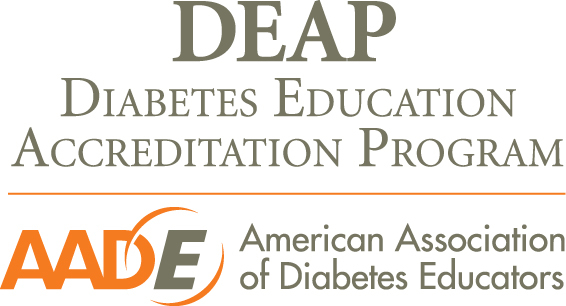 Our diabetes education program is accredited by the American Association of Diabetes Educators. Our program includes four certified diabetes educators (CDE), two being registered nurses (RN) and two being registered dietitians (RD). We also have an additional RD educator on our team. Our nurse CDEs are also certified insulin pump trainers on specific pumps. Recognizing that a one-size-fits-all approach does not work for diabetes management, our team of highly trained dietitians and nurses work with each patient to tailor a program that includes healthy eating, physical activity, self blood glucose monitoring, taking medications, problem solving, healthy coping and reducing risks to fit his or her lifestyle. Group classes or one-on-one support sessions allow patients to learn the skills they need to take control of their diabetes, lower their A1c and live healthier lives. We offer group classes and individual appointments at Hillcrest Medical Center and Hillcrest Hospital South. We also offer individual appointments at Hillcrest Hospital Claremore. These appointments are one-on-one with a registered dietitian and generally last about one hour. Primary topics discussed are weight loss, healthy eating, portion control and the importance of exercise. Each appointment is a flat fee of $15 for an individual and a guest. This education consists of two classes, both taught by a registered nurse and registered dietitian. These classes are scheduled one week apart; the first class is 4 hours long and includes a learning lunch and the second class is 3.5 hours long. Class topics include healthy eating, exercise, acute and chronic complications, problem-solving, goal setting and on-going support planning. We emphasize blood glucose monitoring as well as provide and train the patient on a glucometer if they do not already have one. We also discuss all medications and encourage healthy lifestyle behavior change. With individual appointments we can create a specific care plan for the patient and focus on individual needs and concerns. We tailor each and every appointment to meet the needs of the patient and/or the physician requests. Topics can be similar to the Type 2 Diabetes class topics as well as include weight-loss, reducing cholesterol, insulin to carb ratio, specific carb counting, specialized meal plans, portion control, medication timing, CGMS studies, etc. A physician referral is required. Ask your physician to either fax or mail a referral. After we receive your physician’s referral, our staff will confirm your insurance benefits then call you to schedule an appointment. Many insurance plans and Medicare cover these services for their members. Once you have an appointment scheduled, please fill out the appropriate assessment forms and bring them with you to your first appointment. Our focus with every patient is to help them learn healthy lifestyle behaviors, lower their A1c and fill them with as much diabetes knowledge as possible. Whether you have recently been diagnosed with diabetes or have been long ago, turn to our accredited and devoted staff to help living with diabetes better for you. Let’s do this together! Hillcrest Medical Center is a 620-bed hospital located in midtown Tulsa, and offers a wide range of inpatient and outpatient services including maternity, cardiology, emergency, burn care, orthopedics and surgery.